Take a brief scroll through your Instagram feed and chances are you'll spot a food photo. 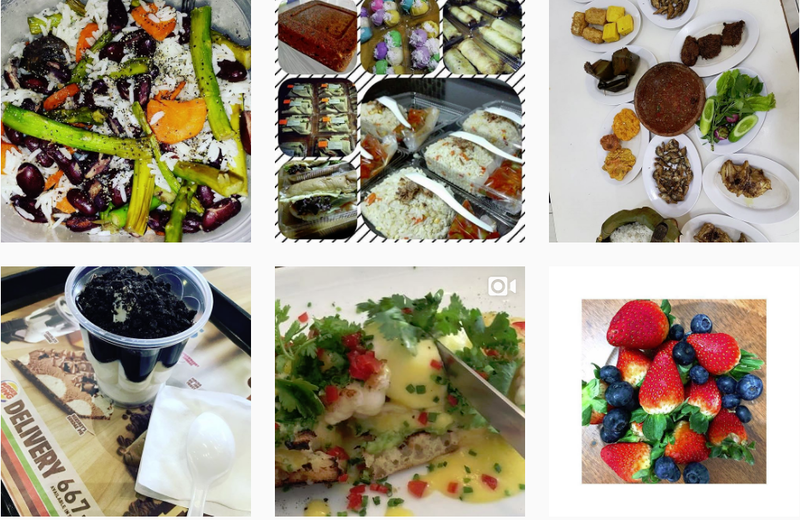 Indeed #food, #foodporn #instafood and #yummy are amongst the 100 most popular Instagram hashtags attached to a cumulative 438,921,588 photos on the platform. 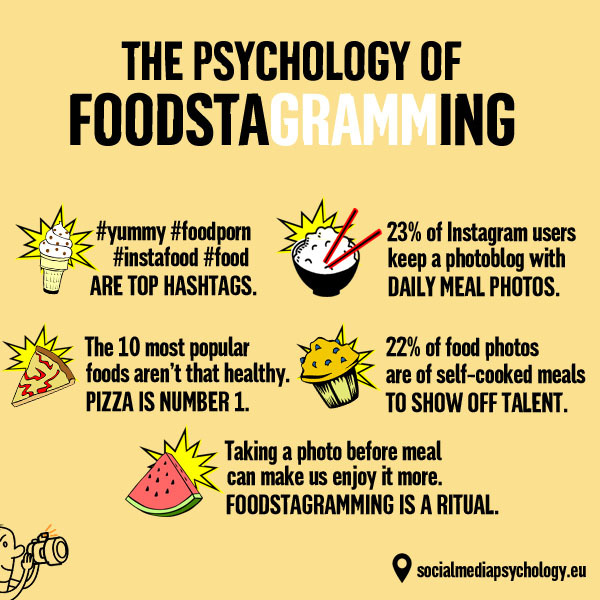 That makes food the most photographed subject on the network - and that's without counting all other hashtags that refer to meal indirectly. Food photos are huge on social media because they're both easy-to-produce and relevant to everyone. For one, they're a quick way to show others what we're up to. Data from digital marketing agency 360i shows that 25% of food photos are motivated by the need to document our day for the public. Posting aesthetic snapshots of gourmet dishes is also a part of our visual self-presentation: polished photos show us in a positive light to others. Approval and validation seeking are other strong motives: 22% of food photos show self-cooked meals, of which their creators are particularly proud. #foodporn = Grace before meals? Taking a photo of your food is a form of ritualistic behavior, too. In a way it's similar to praying before meals. A series of experiments published in Psychological Science showed that people who perform brief rituals before eating reported that they enjoyed the food more compared to those who simply sat down and consumed it right away. A longer delay between the ritual and the meal works even better, as it increases pleasure anticipation. Photographed food can taste yummy even if we wouldn't normally enjoy it, reports New York Magazine quoting a recent paper published in the Journal of Consumer Marketing. Seeing other people's photos of 'healthy' food can trick us into believing that it's delicious. Researchers from the University of Pennsylvania, University of Southern Carolina and Yale University elaborate on the act of photo-taking: it seems that taking a photo during a positive experience (bus tour around a city, a meal) can make us feel happier - so long as it doesn't interfere with the experience itself. Frequent photo-taking can signal underlying eating disorders or unhealthy habits. Some argue that it can make us gain more weight, as we start to obsess about food and regard meals as magnets for likes. A huge segment of people seem to do just that: according to Business2Community, 23% of all Instagram users photograph their food for a photoblog or as a food diary. And it's seldom spinach soups or broccoli salads that get posted - hotdogs, donuts, burgers, steaks and tacos are all among the 10 most popular Instagrammed foods - and pizza is on top of this calorie-laden list. Others claim that taking food photos can help patients recover from eating disorders such as anorexia. Recovery accounts are becoming increasingly popular mainly with young women and girls in various phases of their eating-disorder, reports The Atlantic. They're used as detailed food diaries and record the patient's progress. At the same time such accounts serve as an "anonymous support system" in the form of receiving likes from other users. When did you last take a photo of the dinner table? More than 200.000 images were posted on Instagram while you were reading this article, and a substantial portion of them display food from around the globe. This has a simple explanation, says psychologist Nathalie Nahai: when we post food pictures online, we create an atmosphere of intimacy. Food is a universal language, and sharing it - albeit only virtually - helps us bond with each other. The vector images used to create the visuals above are from Pixabay.com. Many thanks to all authors.